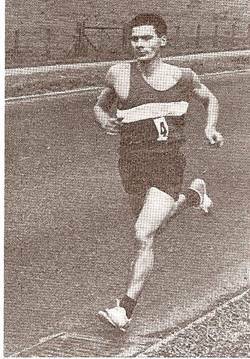 Gordon Eadie of Cambuslang Harriers won the Scottish Marathon Championship in 1960 having been second to Hugo Fox the year before. He was far from a ‘one trick pony’ however with a long illustrious career that included excellent racing on the road, over the country, on the track and in the hills. Jackie Foster of Edinburgh Southern Harriers is quoted in Clyne and Youngson’s ‘A Hardy Race’ as being “one of nature’s true gentlemen, very modest and unassuming.” I can corroborate that having met and raced against him – or rather behind him – in the late 1960’s and early 1970’s. The first mention of Gordon Eadie in the Cambuslang Harriers history on their website is when he was a member of the team that was eleventh in the Edinburgh – Glasgow Relay and won the most meritorious medals – or rather ‘the medals for the most meritorious unplaced performance’. Another member of that team was Andy Fleming who ran for Scotland in the International Cross Country International that year and they were key members of many a Cambuslang team for years to come. In terms of the club championship Gordon won it for the first time in 1959. It was also the year when he won his first marathon medal. In 1960 he started the year by leading a Cambuslang team with Andy Fleming to win the silver medals in the inaugural Tom Scott Road Race. His real triumph however was improving on his 1959 run and winning the SAAA Marathon Championship. ‘A Hardy Breed’ again: “The 1960 Scottish Marathon, finishing once again at the Old Meadowbank Stadium, took place on a particularly hot, sunny day. Gordon started cautiously and ran an even paced race, making steady progress and passing the leaders in the later miles to win convincingly in 2:36:40 from John Kerr (Airdrie Harriers) and Charlie Fraser (Edinburgh Southern)”. He was awarded the Donald MacNab Robertson Trophy awarded by a committee consisting of three members of the Scottish Marathon Club and three members of the SAAA to the outstanding Scottish Road Runner of the year. In the following cross country season (1960/61) he qualified for the Scottish International Cross country team where finished 50th to be counting member of the team. Not content with running in the marathon he started on ultra distance running and in 1963 he won the Edinburgh – Glasgow 45 miles race and won by 37 minutes in a new course record of 4:51:17 on a day of rain plus a driving headwind. (There is a detailed report of this race in the ‘Point to Point’ section of this website). He won the event again in 1964. Although he had to withdraw from the 1965 event, clubmate Andy Fleming won it. He only had it for a year however because Gordon won it back again in 1966, taking ten minutes off his record time in the process. He then went South of the Border where he won the Liverpool to Blackpool race which he won by 10 minutes. There was another silver medal in the Scottish Marathon Championship in 1966 in a time of 2:28:18 and his club mate Andy Fleming was third in 2:32:47. The race was run from Westerlands in Glasgow out to the Strathleven Estate in Vale of Leven and back up the Great Western Road Boulevard – the trail on which Ian Harris defeated Jim Alder in 1961. On a warm afternoon the field included Charlie McAlinden (Babcock’s) who had originally been encouraged to run the marathon by Harry Fenion and who had won bronze in the Scottish Marathon in 1964 and been fifth in the AAA’s Championship in 1965. Hugh Mitchell (Shettleston), Gordon and Andy Fleming from Cambuslang were there and Don Ritchie of Aberdeen was starting in his second marathon. Hugh had been told that a 2:25 time would qualify the winner for the Jamaica marathon so he started out quite quickly accompanied by Charlie McAlinden with a small pack containing Gordon Eadie and Don Ritchie not far back. At the halfway mark (Strathleven Estate) there was little change when they turned back to face the hills that had caused so much damage in 1961. After keeping to a 2:23 pace, Hugh Mitchell had to drop back at 20 miles leaving Charlie on his own. Charlie had an exra problem in that he did not drink at all on this hot day. His friend Tony McManus (who also ran for Babcock’s) was meant to hand him a drink at 20 miles but that wasn’t allowed in the strict rules of the day – feeding points were at strict intervals and 20 miles wasn’t one of them! At 24 miles – the point where Jim Alder was really suffering and passed by Ian Harris – Hugh Mitchell dropped out. Gordon had started to make a real effort to catch the leader at about 20 miles and chased hard through 23 miles. He moved into second behind Charlie McAlinden but the heat and the course was taking its toll and many were dropping out or dropping back. Charlie found the energy to raise his game a bit in the last two miles to win in 2:26:31. What a group of runners! In front is Andy Fleming, number 13 is Willie Kelly and Number 1 is Gordon Eadie (all Cambuslang), number 2 is Charlie McAlinden (Babcocks), in the dark vest behind him is Brian Goodwin (Bellahouston Harriers), behind Kelly’s right shoulder is Bill Stoddard (Wellpark) and inside Eadie is Davie Simpson (Motherwell). Picture probably taken at Gourock HG – does anyone know better? Cross country internationalist, marathon champion and ultra distance record breaker, Gordon also had a go at the hills. 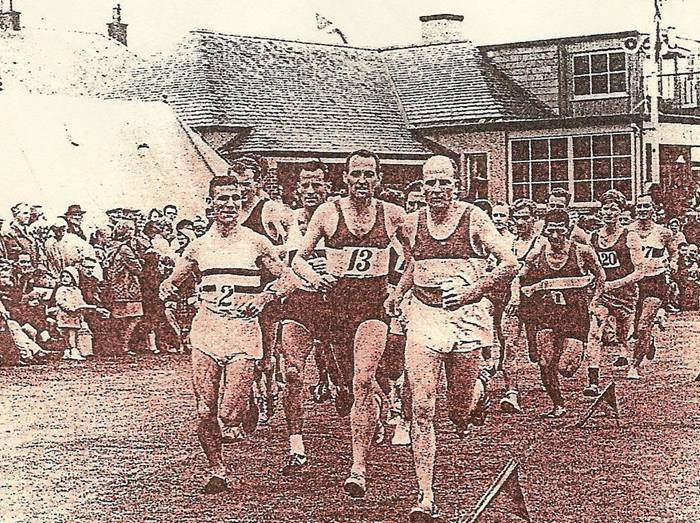 He ran the Ben Nevis race where he finished one place behind rival Ian Harris of Beith in fourth place – they were the only Scottish runners in the first ten, there were only three in the first fifteen because as well as the usual complement of Englishmen there were several teams of Gurkhas competing that year. He had several good races with Harris – they were both in the International cross country team that year and they had crossed swords several times and Gordon had beaten Harris in the Strathallan 20 by four minutes to be second to Norman Ross of ESH with Harris third. His career extended through the 1970’s and he was a member of many good and very good Cambuslang teams. They returned to the Edinburgh to Glasgow in 1972 and finished twelfth and getting the most meritorious medals again. In 1974 he again took part in the SAAA Marathon where he was fifth in 2:25:22 to be ranked tenth in Scotland. (He had been twelfth in 1968 with 2:34:04, fifteenth in 1969 with 2:31:07 and sixteenth in 1971 with 2:27:45). 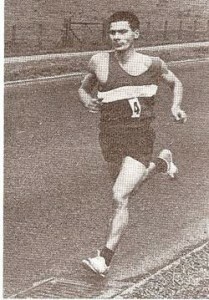 He went on winning medals for the club as it improved from bronze to silver in the County and District championships for the first time and the circle was completed when he again won the club Senior title in 1979 – 20 years after his first victory and after a quite remarkable athletics career. Personal memories are of a cheery, friendly runner of great talent and courage. No conceit – I have found that the really good runners never have any conceit and are sociable and helpful to others, it’s the ‘nearly good runners’ who tend to have the conceit – although he had more to be conceited about than most! I even remember him running on the roads at Airdrie where the road race is a hard 13+ miles and returning to the stadium to turn out in the 5000 metres team race on cinders! A wonderful man and a great credit to himself, his club and to Scotland. Finally, a tale from Cambuslang Harriers about his training. Apparently Gordon could not make the Sunday morning training runs so to accommodate him the other runners (Andy Fleming, Willie Kelly and others) agreed to do the run in the afternoon – they assumed that it had something to do with the physically demanding nature of his day job. He always turned up in the afternoon and then they eventually found out what the problem was – he would go out for an 18 mile run in the morning, have a sleep then go out in the afternoon with the club!